A young Chicanita hawks La Raza newspapers at the Poor People's Campaign, Washington, D.C. May-July 1968. Community activists confront L.A. Board of Education administrator Ed Bonilla. Circa 1969. 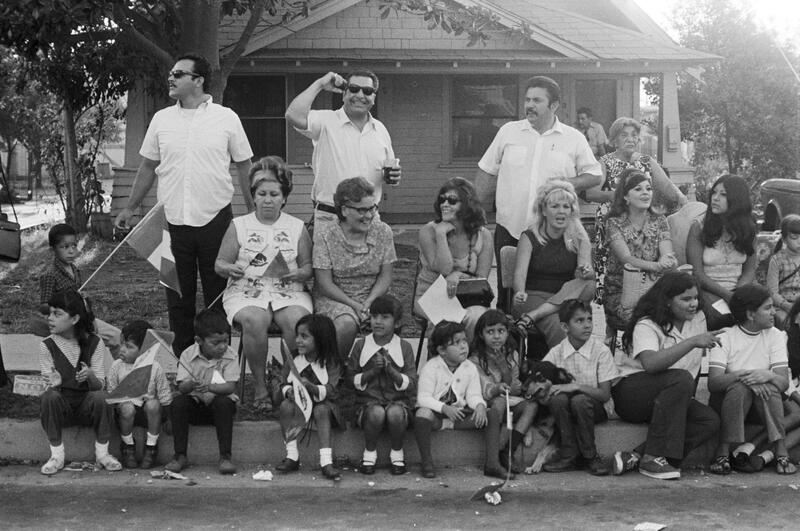 La familia at the Mexican Independence Day Parade, East L.A. September 16, 1970. Youth from South Central L.A. arrive at Belvedere Park for La Marcha por la Justicia. 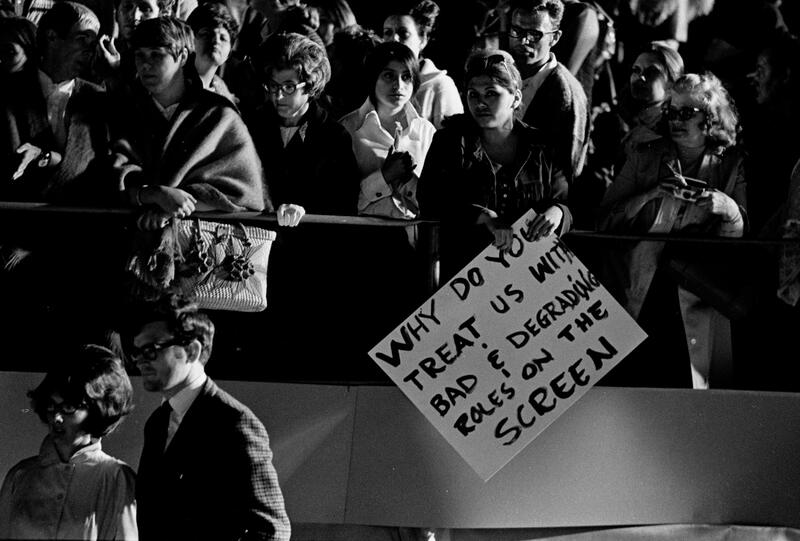 January 31, 1971. L.A. County Sheriff's Department deputies on Whittier Blvd. 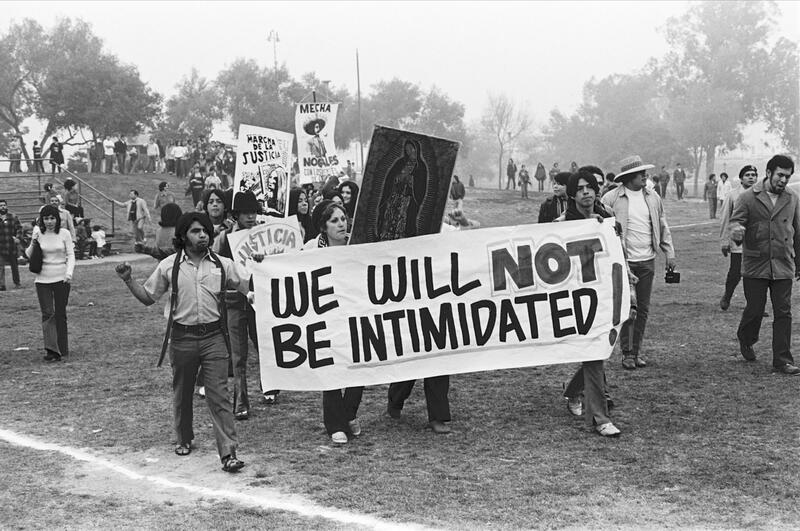 during La Marcha por la Justicia, East L.A. January 31, 1971. Youthful United Farm Workers of America supporter from Texas. Circa 1973. 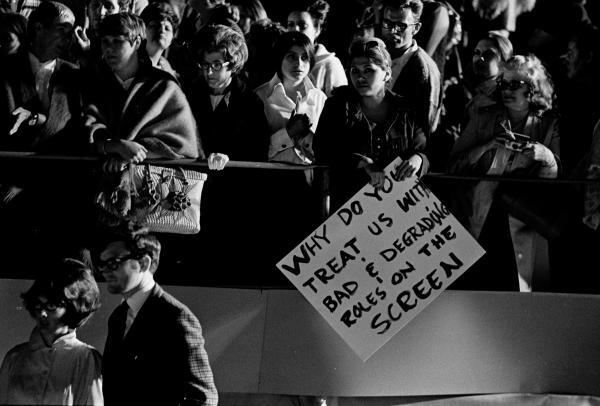 Protestors outside the 42nd Academy Awards, Hollywood. Circa 1970. 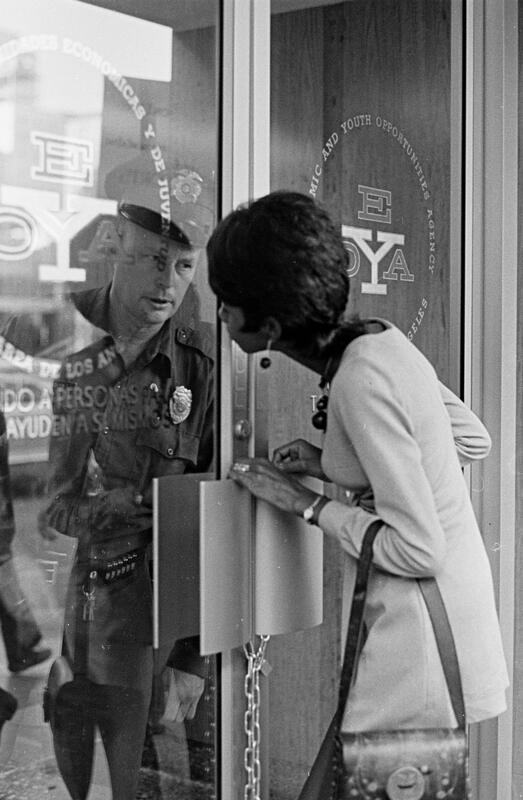 A woman outside the locked Economic and Youth Opportunities Agency exchanges glances with a police officer inside. Circa 1973. 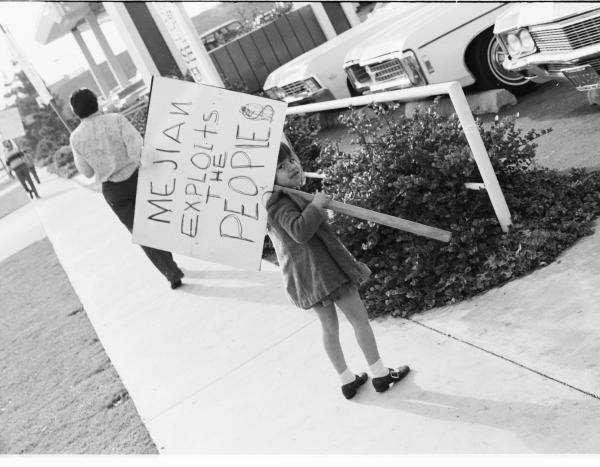 Chicanita protesting unfair labor practices at Mejian Chevrolet Car Dealership, East L.A. Circa 1972. 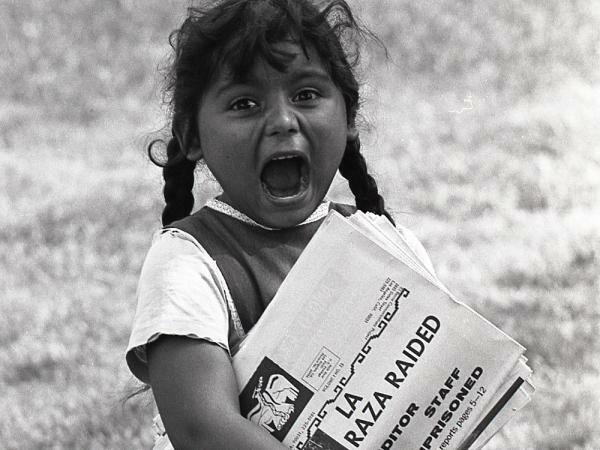 A young Chicanita hawks La Raza newspapers at the Poor People's Campaign, Washington, D.C. May–July 1968. 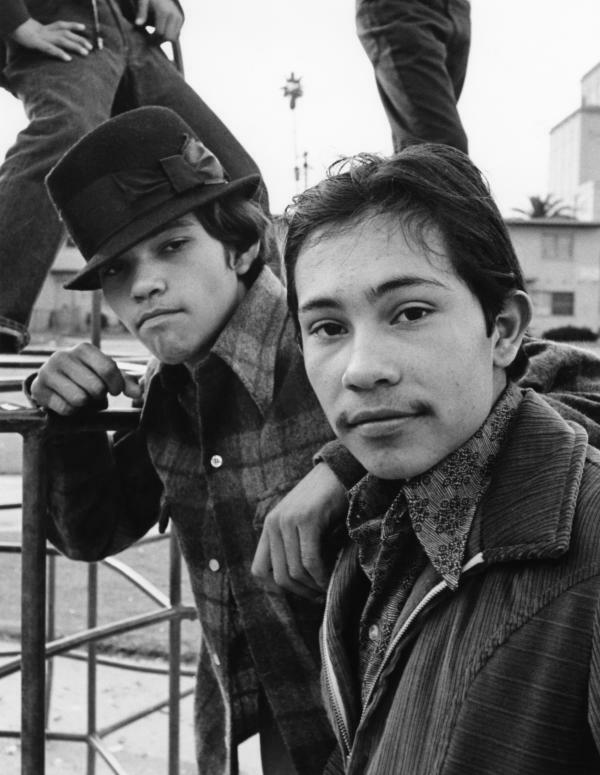 Homeboys, Aliso Village / Pico Gardens housing projects, Boyle Heights, East L.A. 1972. Students argue with school administrator during the Walkouts. Circa 1968. Garza, who co-curated the exhibition with Amy Scott, is being a little dramatic, but he's not wrong. The country has finally started paying attention to Latino culture. Planning for Pacific Standard Time: LA/LA, a huge, international group of shows focusing on Latin American culture in the Americas and in Los Angeles, was underway, spearheaded by the powerful Getty Museum. 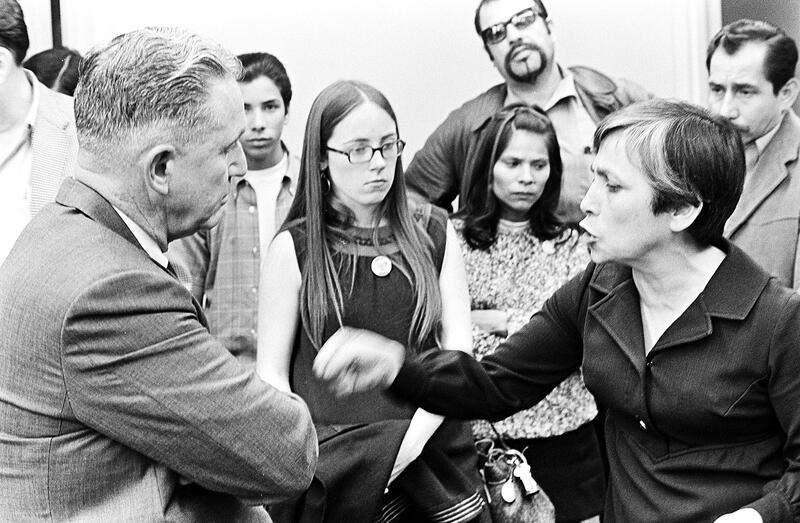 And at about the same time, Garza and others had begun to review thousands and thousands of photographs taken during the Chicano Rights movement. Photographers from La Raza (literally "the race"), an activist newspaper-turned-magazine published from 1967-1977, chronicled Chicanos in LA and Southern California; it would become nationally significant. After the magazine shut down, the archives were eventually gifted to UCLA's Chicano Studies Research Center. Years later, the Center wondered if the Autry might be interested in doing something with them. The Autry was. Rick West, the museum's president and CEO, jumped at the idea. The museum's mission, West says, "is to look at the cultures that make up the American West in a very inclusive and pluralistic way." The La Raza exhibition had all the elements. "You have what was a very, very important moment 50 years ago in Latino/a history—the Chicano rights movement," West ticks off. 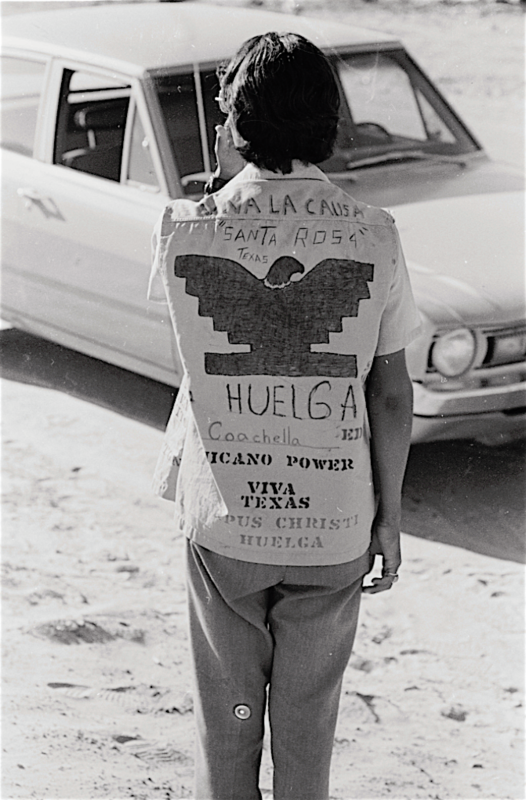 "You had the voice that articulated that—the photographers of La Raza. And that voice was a first-person voice": photographers as witnesses. About 200 of the 25,000 (yes, that's not a typo) photographs are up on the Autry's walls. And they are only the tip of the visual iceberg. "The vast body of this work has never been seen, has never been printed—until now," Garza says. 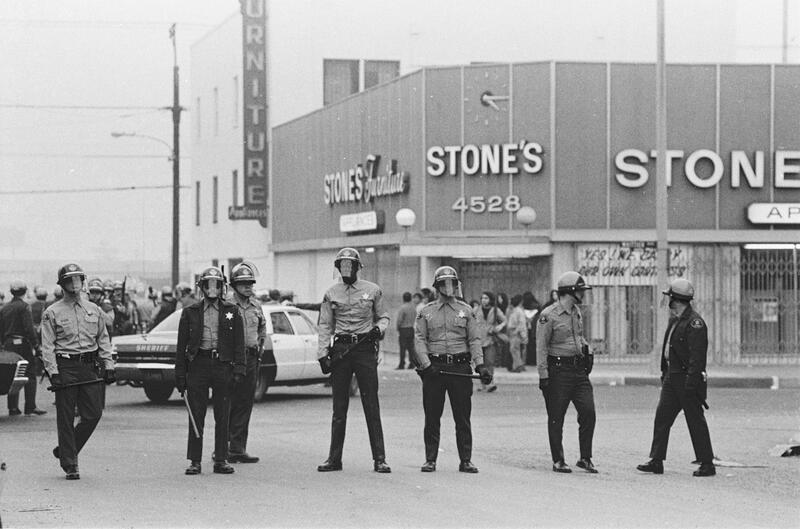 "From the mundane to the magnificent"
The photos—all black and white—range from shots of homey gatherings (neighborhood barbecues, parades, playground scenes) to protests, demonstrations and boycotts. On one wall, a line of Mexican Americans stretches to the distant horizon. They're walking down a long dusty road waving banners and placards. Participants in La Marcha de la Reconquista covered almost 1,000 miles in a month. They started from Calexico, in California's Southern-most boarder, and walked to Sacramento to lobby the state government for several things, including improved conditions for farm workers, and an end to police brutality. In another shot, a little girl walks with a huge sign that warns onlookers a local auto dealership engages in discriminatory labor practices. There are photos of high-school students during a convulsive series of walk-outs, as students protested the shabby education the Los Angeles school board thought was good enough for them. And a fetching picture of a bridal couple, still in their finery, who left church immediately after their vows and marched with the crowd to protest the inordinate numbers of Chicanos that had been drafted, injured and killed in the Vietnam War. Most of the photographers were self-taught. Before he joined La Raza as a staff photographer, Garza apprenticed with a professional, learning exposures, lighting, composition and developing. When he went to the paper, he took those skills and shared them with others who wanted to shoot. "We were mentoring each other," he says now. The exhibition shows they were quick learners. They're not all memorable photos, Garza says; there's a little of everything here. "You go from the mundane to the magnificent." One of the most memorable was taken by one of a handful of women photographers. Maria Varela's portrait of a little girl hawking La Raza at the Poor People's Campaign in Washington, D.C. is a standout for its energy and its size—it's one of the photos that have been blown up into a stele-sized image. 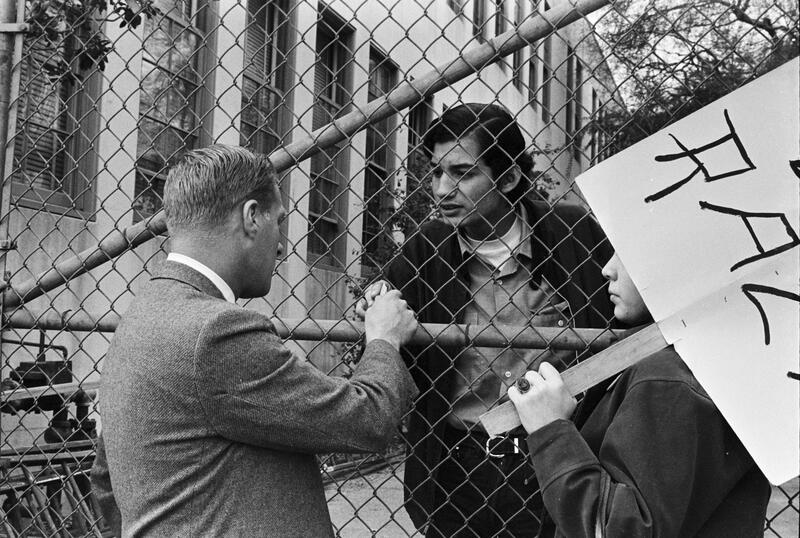 Varela had a long and storied career as a Chicana who went south in the early 60s to photograph the Student Nonviolent Coordinating Committee, or SNCC, as volunteers worked to register black voters in Mississippi and Alabama. In 1968, she came to D.C. with a contingent of Chicanos who'd come to participate in several Poor People's Campaign marches. She doesn't remember the little paper girl's name, but she says, "This might have been the time that everyone emptied out to go up to Arlington Cemetery to honor Robert Kennedy, who had been assassinated two weeks before." "This was our Facebook. This was our communication network. It was a little clunky, but it got the word out about what was going on in these individual communities." The Autry Museum sits near several Latino communities, and the La Raza show may draw in people who've never crossed its threshold before. Some may be surprised to find faces they know in this exhibit—of long-lost friends, family, maybe even their own. Luis Garza looks around the gallery and smiles. "That's the beauty of the power of photography," he says. "If one picture is worth a thousand words, how many are being said in this exhibition?" Oh, and he might be right about that serendipity thing: La Raza opens to the public on September 16—Mexican Independence Day. The movement to achieve civil rights for African-Americans is well known at this point. What fewer people probably know is that a parallel movement for civil rights for Mexican-Americans was going on at the same time. In Los Angeles, the Autry Museum of the American West has gathered together previously unseen photos from that time in a new exhibition. Just before it opened, Karen Grigsby Bates from our Code Switch team got a sneak peek. KAREN GRIGSBY BATES, BYLINE: It's mid-morning at the Autry Museum. I'm walking through tall doors into a darkened room. Dozens and dozens of framed photos lean against the walls waiting to be hung. Pictures of boycotts, of long distance marches, of young dandies posing for the camera. There were also a couple of huge images the size of posters and bus shelters. Luis Garza co-curated the exhibit. LUIS GARZA: You come into this space here and you see these large, huge blowups that we've done with some of these photographs. BATES: He leads me to an image that stops me in my tracks. GARZA: This is a photograph taken by Maria Varela. BATES: It's a photo of a little girl, maybe 5 years old, with brown skin, her dark hair in pigtails. 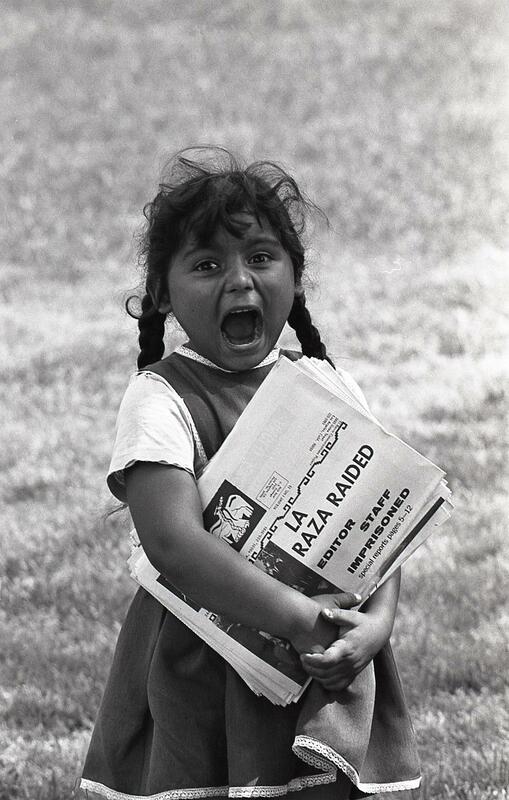 Her little arms clutch a bunch of newspapers, and Varela's camera has caught the child with her mouth wide open as she shouts for buyers to come. That's such a great photo. BATES: All these are photos from La Raza, a newspaper-turned-magazine that covered the lives of California's Chicanos. That's what many political Mexican-Americans called themselves back then. Garza, who was a La Raza photographer in the '60s and '70s, says the photos in the exhibition are just a sampling of some 25,000 images from La Raza's archives. GARZA: The vast body of this work has never been seen, has never been printed until now. BATES: They're not all masterpieces, and he's OK with that. GARZA: We did not edit. We brought everything in. So you go from the mundane to the magnificent. BATES: The La Raza photographs captured a turbulent time in American history. And 50 years later, Garza says, a lot of the issues they addressed are still relevant. Back then, LA's Chicanos were largely invisible in the media. GARZA: The coverage of what was going on within our community was nil to nonexistent at all. BATES: So there are photos of the walkout staged by thousands of students in East LA to protest the segregated substandard education they were being given and shots of a huge Chicano anti-war demonstration. GARZA: You'll begin to see photographs of the Vietnam War, the August 29 Moratorium march. BATES: Of all these photos, Maria Varela's little news girl haunted me. I wanted to know more, so I called Varela at her home in New Mexico to ask if she remembered what was happening that day when the photo was taken. She said it was 1968, when a Chicano delegation had traveled to Washington, D.C., to participate in the Poor People's March. MARIA VARELA: There's a vague recollection that this might have been the time that everybody emptied out to go up to Arlington Cemetery to honor Robert Kennedy, who had been assassinated, like, two weeks before. BATES: Varela photographed that march and dozens more for La Raza. She says the paper and others like it kept Chicano communities across the West connected. VARELA: This was our Facebook. This was our communication network. It was a little clunky, but people got the word out about what was going on in these individual communities. BATES: Many of those communities have changed over time, but they're preserved in the photographs here, evidence of Chicano purpose and pride. Karen Grigsby Bates, NPR News. (SOUNDBITE OF GARY DELANEY'S "EVANESCENCE - JEREMY ROWLEY REMIX") Transcript provided by NPR, Copyright NPR.